Coverage of the complex, perverse and joyful musical work of the sadly incapacitated Tim Smith – whether inside or outside his mothership Cardiacs band – frequently figures in here. It’s good to bring you all more about his continued crossover from cult status to something wider: this time, with news of a conservatory jazz gig in Amsterdam and of the continued afterlife of Spratleys Japs. 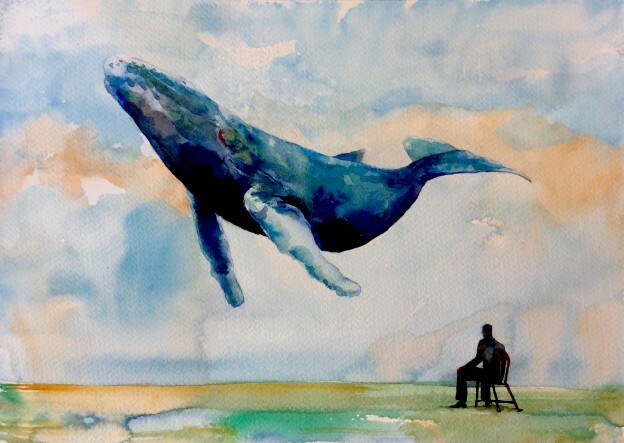 “Composers are not necessarily dead. They also do not necessarily write symphonies in D flat minor in a 4/4 time signature. 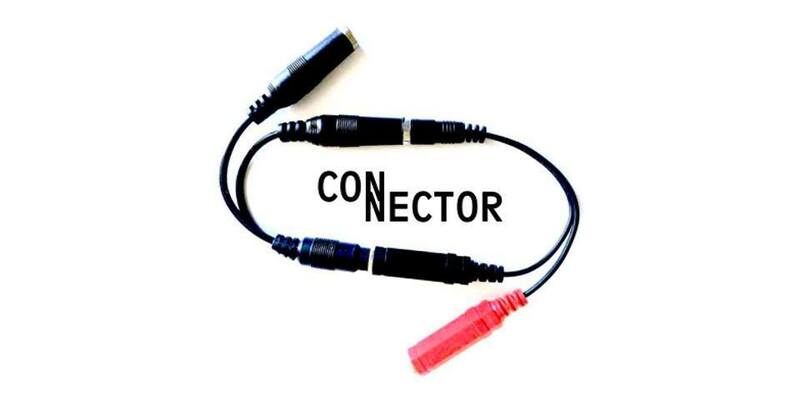 Connector V is part of a monthly series at Steim: regular readers should recognise this particular one as a follow-up to the Smith-covering set by Alex Brajkovic Ensemble at Amsterdam’s Jazz Ensemble Festival back in April, and it does in fact feature most or all of the same players, put together by rebel prog professor Jos Zwaanenburg. No-one seems to have recorded/posted evidence from the last time, so I can’t show you how it went – but as before, I can give you some very loose indications as to how this concert might might turn out by referring you to English Rose Orchestrations’ string quartet version of one of the featured pieces, The Duck And Roger The Horse. 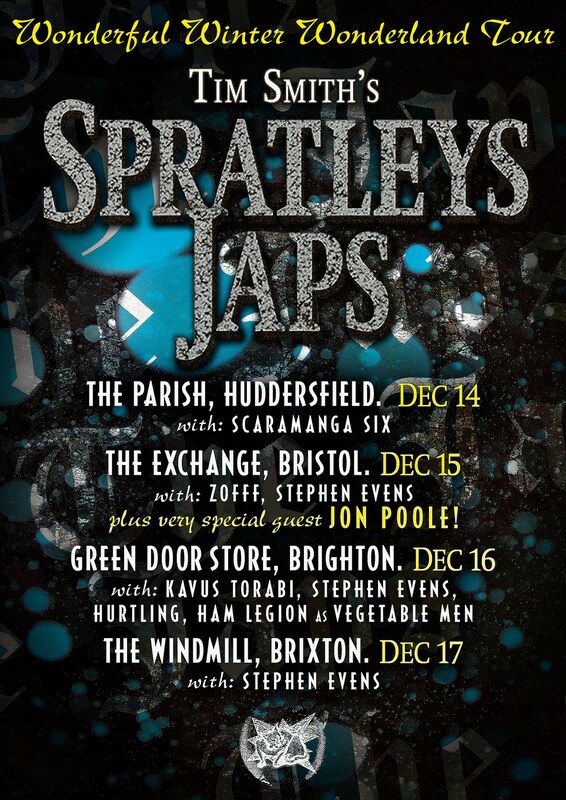 The following month, Spratleys Japs consolidate the success of their Brighton and London reunion shows over the last couple of years by setting out on a bigger, broader English tour taking in Yorkshire and the West as well as the south east, with a mass of current/former Cardiacs and friends coalescing as support around the tour dates. Read more about SJ here: in brief, though, they’re a short-lived and swampy alternate-universe pop project (part alien folk maunderings, part glam-punk punch and part spindly antiprog) which Tim put together in the mid-’90s with then-girlfriend/muse Jo Spratley. Now revived by Jo and a collection of Brighton art rockers, they’ve got a second wind and have been rattling through fresh gigs partially in tribute to Tim and partially because the enthralling, infuriating puzzle-box songs have a peculiar life of their own. As regards the backup, looming raconteur Stephen Evens brings his scowling, sardonic British pop along to the London, Brighton and Bristol shows (possibly with full band in tow for all of them). In a similar vein, Yorkshire dark-melodrama rockers The Scaramanga Six pile in at the Huddersfield date, while the Brighton show also sports vigorous dream poppers Hurtling and noisy art-rock goons Ham Legion (the latter performing their Syd Barrett tribute as “Vegetable Men” (plus another acoustic set from Kavus Torabi, squeezing in time in between fronting Gong, Knifeworld and his radio broadcasts). At Bristol there’s another onetime Cardiacs guitarist, Jon Poole, possibly bringing both solo stuff and one-man versions of his clever-pop work with The Dowling Poole; plus ZOFFF (the reverberant south coast kosmische/deep-psych band featuring Crayola Lectern‘s Chris Anderson and yet another ex-Cardiac six-stringer, Bic Hayes). The Windmill, 22 Blenheim Gardens, Brixton, London, SW2 5BZ, England, Sunday 17th December 2017 (with Stephen Evens + others tbc) – information t.b.c. UPDATE, 18th October – apparently we can also expect a couple of imminent fundraising Cardiacs cover versions from Spratleys Japs and Stephen Evens (Odd Even and Two Bites of Cherry), plus other surprises they’re keeping a little tightlipped about for the moment.